Republicans say big Democratic majorities in Olympia would mean higher taxes, more regulation. The Legislature would “look like the Seattle City Council,” said state Republican Party Chairman Caleb Heimlich. OLYMPIA — A sweeping health-care expansion. A capital-gains tax. New environmental legislation. The prospect of large majorities in the state Legislature has some Democrats hoping they can make good on ideas they’ve long championed but have been blocked by Republicans — and fellow Democrats within their small majorities. Last week’s primary-election returns found Democrats leading in about 20 state House and Senate races against either Republican incumbents or GOP candidates running for open seats the party had held. Ballots are still being counted and it remains to be seen how many of those Democrats ultimately prevail in the primaries and, of course, in the November general election. Still, Democrats are showing strong primary results in regions that few had considered truly competitive. In the Spokane area’s 6th Legislative District, one Democratic House candidate leads a GOP incumbent while in the other House seat, a pair of Democrats have a combined 52 percent of the vote. In the 10th District, which includes Island County and parts of Skagit and Snohomish counties, Democratic challengers are besting two Republican incumbents. Likewise, in Whatcom County’s 42nd District, Democrats are leading two GOP House incumbents. And Democrats are excited about the possibility of defeating Sen. Doug Ericksen, R-Ferndale, who had about 46 percent of the vote in Friday’s totals while a pair of Democrats together had the majority of ballots cast. With the primary results so far, Democrats have a chance in November to see their legislative majorities swell to the largest in a decade. Since 2013, neither Republicans nor Democrats have held more than a two-vote majority in the Senate. And though Democrats have held the House since 2002, their large majorities of a decade ago are long gone. The party has held a 50-48 edge since 2016. Now, the possibility of bigger majorities has Democrats discussing bigger ideas. Tina Podlodowski, chair of the Washington State Democratic Party, said the party could push to expand affordable health care. And other Democrats say it’s time to pass a capital-gains tax, which lawmakers and Gov. Jay Inslee have proposed in recent years. 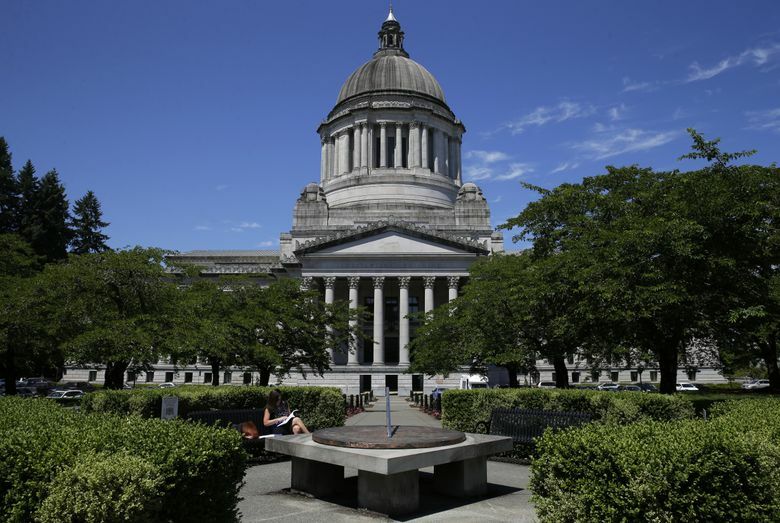 While Democratic leaders have criticized Washington’s regressive tax system, they have never given those bills floor votes in the House or Senate. The speculation about Democratic gains and the party’s agenda doesn’t sit well with the GOP. Wilcox said a swing of power “to a much more progressive and maybe a little bit of a radicalized edge” would mean more taxes and more regulations. “And King County legislators, since that’s where some of the swing districts are, really can call the shots for the whole state,” he said. In an interview last week, House Speaker Frank Chopp, D-Seattle, disputed that characterization. “That’s not going to happen,” he said. With larger majorities, Democrats could focus on expanding affordable health care and finding ways to boost jobs across the state, Chopp said. He acknowledged that Democrats could consider a capital-gains tax, provided that money went toward property-tax relief. Dhingra last year campaigned in favor of a tax on some capital gains to relieve the pain from the property-tax plan that many Democrats reluctantly agreed upon to pay for a court-ordered K-12 school-funding plan. But the day after her November special-election win — which gave Democrats their current 25-24 Senate majority — Dhingra had to admit that her party wouldn’t get to it in the 2018 legislative session. With their slim majority, Senate Democrats said they just didn’t have the votes for it. Dhingra said she wants Democrats to finally approve that tax — excluding gains on retirement accounts and the sale of primary residences — to reduce property taxes. At least two Democratic challengers in surprisingly competitive races share similar views. In the 10th District, Scott McMullen, who is leading Rep. Norma Smith, R-Clinton, criticized the Legislature’s property-tax plan, which ultimately boosts taxes in some school districts and lowers them in others. Jessa Lewis, the Democratic candidate who trails Republican Rep. Jeff Holy by 1 percentage point in Spokane’s 6th District Senate race, also supports a capital-gains tax. “I absolutely am going to be fighting to reduce property taxes,” said Lewis. Holy could not be reached for comment Friday. But even if Democrats get large majorities, it remains to be seen whether they can deliver on those ideas. Their ambitions will bump up against needed — and expensive — fixes for Washington’s mental-health system. That includes a plan to reshape the system following decertification of Western State Hospital, the state’s largest psychiatric facility. Lawmakers in both parties also are determined to boost funding for K-12 special education. And in June, the U.S. Supreme Court left in place a lower-court decision ordering the state to fix or replace fish culverts that block migrating salmon. Chopp called the culvert work an “opportunity” to bring jobs to rural Washington — but it could be expensive. Larger Democratic majorities could allow for more environmental proposals, such as stronger oil-transportation rules and support for renewable energy, said Sen. Christine Rolfes, D-Bainbridge Island. But Wilcox warned that new environmental legislation could hurt rural regions “that are trying to reindustrialize” to attract jobs. With any new punitive regulations, stretches of Southwest Washington or along the Columbia River would “really have no hope left,” he said.